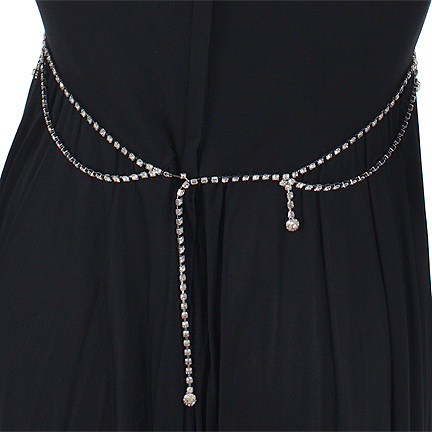 This black cocktail dress was worn by the character Miriam, portrayed by actress Sharon Stone in the 2006 Biopic film “Bobby”. 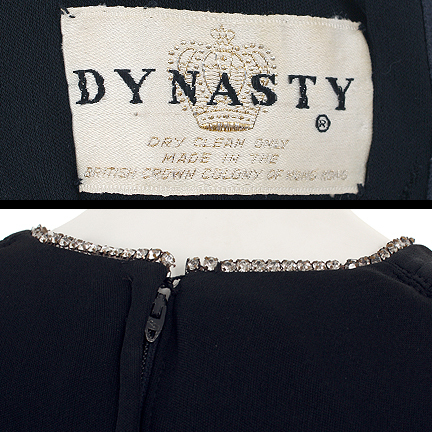 The dress is an original Dynasty 1960’s cocktail dress constructed out of a black jersey knit material with rhinestone trim along the neckline and waist. There is evidence of wear due to age and use during production. This dress can be seen towards the end of the film when Robert F. Kennedy Aka Bobby, gives his acceptance speech for winning the 1968 election for U.S. Senator. The dress is most prominently seen in the aftermath of the shooting of Senator Kennedy when he his being taken away in the Ambulance, Miriam Ebbers (Sharon Stone) shaking with dismay is hugging her husband (Will) William H Macy.